Thanks to Tara Dalrymple of Mission Possible for giving me a loan of Seth Godin’s ‘Tribes’ a few weeks ago. The book, published November 2008, is contemporary – it is becoming even more relevant as time passes. It is a fascinating book, I was half way through it before I realised that it does not have chapters. It is extremely well structured with each point following the one before and leading to the next. It is 125 pages of though provoking ideas with a serious call to action. In this fascinating book, Seth Godin argues that today everyone has an opportunity to start a movement – to bring together a tribe of like-minded people and do amazing things. And yet too many people ignore the opportunity to lead because they are ‘sheepwalking’ their way through their lives and work, too afraid to question whether their compliance is doing them – or their company – any good. Tribes is for those who don’t want to be sheep and instead have a desire to do fresh and exciting work. If you have a passion for what you want to do and the drive to make it happen, there is a tribe of fellow employees, or customers, or investors, or readers, just waiting for you to connect them with each other and lead them where they want to go. You made it to the end. And it’s possible you missed the checklists, the detailed how-to lists, and the For Dummies –style instruction manual that shows you exactly what to do to find a tribe and lead it. … All I can hope for is that you’ll make a choice. Every leader I’ve ever met has made the choice, and they’ve been glad they did. Page 8 asks a fundamental question: Do you believe in what you do? Every day? The author holds that ‘people who like their jobs the most are also the ones doing the best work, making the greatest impact, and changing the most’. By challenging the status quo, one person, just one, can make a huge difference. Seth talks about ‘Heretics’ as being the new leaders. So you may not like the word heretic (Seth uses it on purpose but the word does grow on you as you read the book). Easier to digest may be ‘change agents are key to our success’. Page 19 explains that Managers manage by using the authority the factory gives them. You listen to your manager or you lose your job. A manager can’t make change because that’s not his job. His job is to complete tasks assigned to him by someone else in the factory. Leaders, on the other hand, don’t care very much for organisational structure or the official blessing of whatever factory they work for. They use passion and ideas to lead people, as opposed to using threats and bureaucracy to manage them. Leaders must become aware of how the organisation works, because this awareness allows them to change it. Leadership doesn’t always start at the top, but it always manages to affect the folks at the top. In fact, most organisations are waiting for someone like you to lead them. On page 37, Seth explains that Dr Laurence Peter is famous for proposing that ‘in a hierarchy every employee tends to rise to his level of incompetence’. In other words, when you do a great job, you get promoted. And that process repeats itself until finally you end up in a job that you can’t handle. Seth provides his updated version of the Peter Principle. I think what actually happens is that ‘in every organisation everyone rises to the level at which they become paralyzed with fear’. On page 39, the author makes a wonderful argument that ‘fear of failure is actually overrated as an excuse. Why? Because if you work for someone, then, more often than not, the actual cost of the failure is absorbed by the organisation, not by you. If you product launch fails, they’re not going to fire you. The company will make a bit less money and will move on. How can I create something that critics will criticise? Seth has a classic retort. ‘I think the real question was ‘Isn’t it sad that we have a job where we have to spend two weeks a year avoiding the stuff we have to do fifty weeks a year?” He adds that the reason that he was happy to be reading his emails was that he had passion for his work – because I’m lucky enough to have a job where I get to make change happen. He concludes that life is too short to stay in a job that wears you down (where you are both unhappy and mediocre). The best way to be successful and happy is to set up your life so that you don’t need a holiday to escape. I really like the logic as long as it is not taken too far (which I probably do) so as long as you are not affecting anyone else (family also on holiday) a little work is no harm if it gives you peace of mind. On page 87, we learn that a thermostat is far more valuable than a thermometer. The thermometer reveals when something is broken. Thermometers tell us when we’re spending too much on gaining market share or not answering the phone quickly enough. Organisations are filled with human thermometers. They can criticise or point out or just whine. The thermostat, on the other hand, manages to change the environment in sync with the outside world. Every organisation needs at least one thermostat. The secret to being wrong isn’t to avoid being wrong! The secret is being willing to be wrong. The secret is realising that wrong isn’t fatal. This section talks about the future of charities. It points out the old traditional big winning tactic of direct mail for attracting donations is losing its effectiveness in terms of economic return, and that online donations is not the answer as it not simply like Direct Mail with free stamps. The real answer lies in engaging to turn donors into patrons and activists into participants. The biggest donors are the ones who not only give, but also do the work. On page 101, the author declares that the largest enemy of change and leadership isn’t a ‘no’. It’s a ‘not yet.’ ‘Not yet’ is the safest, easiest way to forestall change. ‘Not yet’ gives the status quo a chance to regroup and put off the inevitable for just a little while longer. 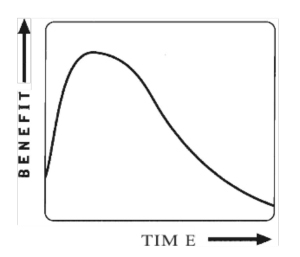 This figure, presented on page 101, shows the benefit of almost any innovation over time. There’s a small price for being too early, but a huge penalty for being too late. The longer you wait to launch an innovation, the less your effort is worth. The Art of Leadership is discussed on page 102. The point is made that a lot of people understand how a magician does a trick and can indeed learn the method of undertaking any particular trick but the magic is in the experience and the performance. Leadership is very much an art (learning the trick won’t do you any good), one that’s accomplished only by people with authentic generosity and a visceral connection to their tribe. On page 115, the author argues that given all the people who are disadvantaged (hungry, poor, oppressed) in the world that we have an obligation not to settle for mediocre, to defend the status quo or worry about politics. I don’t think we have any choice. I think we have an obligation to change the rules, to raise the bar, to play a different game, and to play it better than anyone has the right to believe is possible. 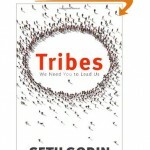 On page 123, Seth asks, ‘What does a leader look like? and his answer is intriguing. I’ve met leaders all over the world, on several continents and in every profession. I’ve met young people and old ones, leaders with big tribes and little ones. I read Seth’s blog by email every single day. I would recommend it highly to include this Q&A blogpost about Tribes. And finally, Unleashing the Ideavirus by Seth Godin (free eBook available here) is also a good read. As always I hope you enjoyed this post. Comments welcome.